Well I liked it. I like him. I like her. Moffat didn’t muff it. What more can I say? Although I feel I ought to say more about Matt Smith’s debut as The Doctor in The Eleventh Hour and how Steven Moffat, writer of the now legendary Blink, fares as the top man. But after watching The Eleventh Hour last Saturday and following it with celebratory tweets and emails, and now doubtless left behind by hundreds of other blog posts I’m finding it hard to think of anything original to say. What I liked about it? 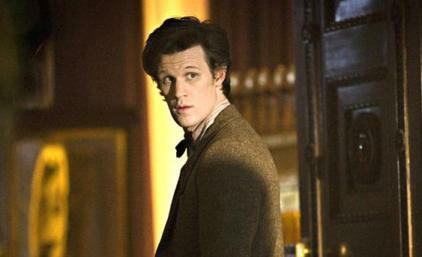 Matt Smith of course, who still managed to exceed expectations despite the anticipation lasting since Christmas 2008. He’s good, and may turn out to be very good, The Eleventh Hour being perhaps the best Doctor Who “changeover” episode in my memory. 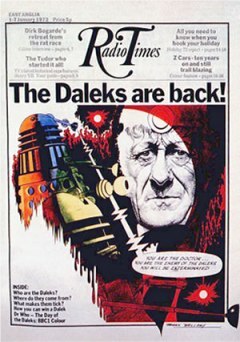 (I can only compare as far back as Robot with Tom Baker in 1974 where I recall him getting stuck in to a battle between UNIT and a giant Tin Machine, and later Peter Davison being rather wimpy and fainting a lot through his regeneration). As long as Smith can curb the wackiness I think there is a real danger and edginess beyond the fringe. He’s followed David Tennant admirably, although maybe the 10th Doc’s soppy eyed staring into space had begun to grate and this is going to be an easier job than anticipated. That 10th incarnation did feel sorry for himself! 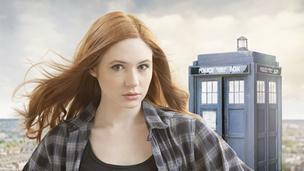 Karen Gillan is very agreeable as Amy Pond, although she didn’t actually do a lot. Not really. But she carries a version of a WPC uniform with aplomb. And the final scene of her stepping gingerly into the Tardis was very endearing. Perhaps I am finally succumbing to a Doctor’s companion for “the Dads” (although it’s about time. I’m sorry but Rose, Martha and Donna didn’t really do it for me). What I didn’t like? Only perhaps that Steven Moffat played a little safe. The structure of The Eleventh Hour did remind of The Girl in the Fireplace with the jumping through time premise to visit key stages in a young woman’s life. Whilst the fairytale element of the story was intriguing, introducing The Doctor as Amy’s brief childhood friend, I felt that Moffat shortchanged us somewhat as he’s covered this theme before. With River Song and the Weeping Angels both returning later in the new series, there’s the danger that he might cling to the edge a wee bit ideas wise and not take a running jump and plunge into the infinite possibilities of the Who universe. 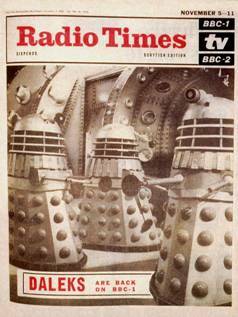 And call it first episode nerves, but Moffat also revealed the worrying tendency to dip into Russell T. Davies territory. 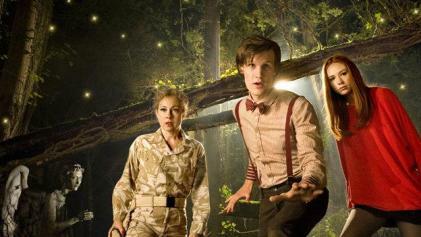 Clips of all previous Doctors (from The Next Doctor), a companion with a gormless boyfriend (echoes of Mickey Smith), some fumbled plot (the coma victims and alien as man-with-barking-dog were very RTD) and the general overblown bombastic storyline (The Doctor arriving on the scene by fire engine) were a little too reminiscent of the over energetic exploits I hoped had been left behind after last Christmas. Moffat only really hinted at his earlier greatness in the Sapphire and Steel like premise of the hidden doorway in a spooky house theme. And what’s to come over the next 12 weeks? 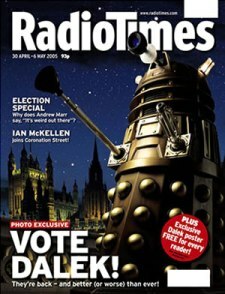 Mark Gatiss pens a Dalek story set during the Blitz that could be interesting, although again this might appear a little too close to the 30s-set Daleks in Manhatten. There’s a vampire story, and Richard Curtis delivers an encounter with Vincent Van Gogh. But it’s all really too early to tell. Like the 11th Doctor shrugging himself into his new body or the Tardis renewing itself somewhat haphazardly, this series might need a little while to bed itself in.